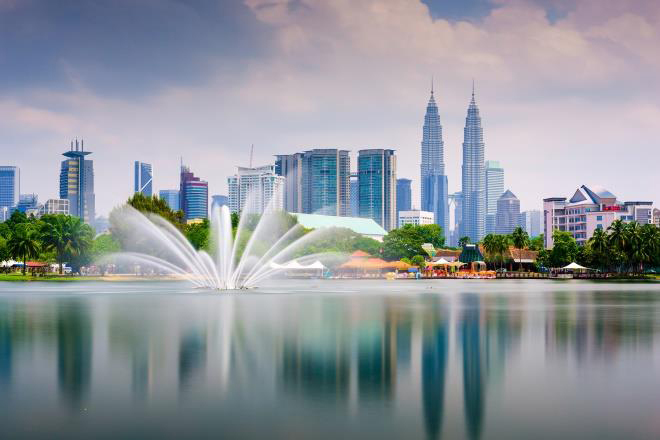 A major water company operates a cluster of Malaysia SEA municipal water treatment facilities that serve a large urban population. With its tropical climate, this region in Malaysia is heavily dependent on gathering surface water for its supply of drinking water. This water source poses special disinfection challenges for the engineers responsible for the company’s water treatment facilities operation. Surface water enters the company’s treatment facility and immediately is dosed with chlorine. This initial disinfection stage removes all algae and other forms of aquatic life. The water then enters a flash mixer and moves into sedimentation tanks to remove any remaining solids. More chlorine is added to oxidize any manganese, iron and sometimes hydrogen sulfide. The addition of chlorine also eliminates odors, taste and color. The filtration and sedimentation stage of the process removes the largest portion of unwanted organisms, so less chlorine is necessary in the subsequent stages of treatment. This means that as the process progresses, there is less contact time for disinfection, requiring close monitoring and careful dosing of chlorine to achieve the desired results. During the final stage of the disinfection treatment process, chlorine again is added to treat the water when it enters the distribution network. The chlorine travels with the water throughout the distribution network on its way to end-customers, which ensures the final delivery of safe drinking water. Water disinfection with chlorine has been one of the most important public health achievements of the twentieth century. Chlorine eliminates many disease-causing organisms, such as cholera, hepatitis A, typhoid fever and dysentery. Chlorine also has been beneficial in eliminating slime bacteria, algae and molds that can grow in reservoirs. Chlorine continues to be a popular water disinfection treatment method because of its relatively low cost and availability around the world. There have been many methods developed to measure chlorine and thereby determine correct dosing concentrations, including the standard N, N-diethyl-1, 4-phenylenediamine sulfate (DPD) colorimetric method and several types of amperometric and polarographic methods. For many years, the company’s cluster of water treatment plants had maintained and controlled its chlorine dosing with the help of an automated colorimetric analyzer. The analyzer was supposed to determine the correct amount of chlorine to dose into the water at each stage of the disinfection process. Determining the correct level and dosing of chlorine is a critical step in ensuring that the proper amount is added to disinfect and remove any types of pathogens from the raw water. The colorimetric analyzer, however, is not a real-time measurement device, and this created problems with improper chlorine dosing. Depending on the time of day, the weather conditions and other variables, the concentration of pathogens in the untreated water could vary significantly over 24 hours. That led either to dosing with an insufficient amount of chlorine or adding too much into the process. As a result, the treated water often had to be returned to the disinfection system for a time-consuming, expensive second treatment. The high cost of maintaining the colorimetric analyzer was another issue. For effective operation, the plant staff had to keep changing out the system’s reagents on a monthly basis. The caustic reagents also led to the frequent failure and replacement of sample pumps. For the same reason, tubing had to be replaced frequently. All these issues resulted in a high cost of maintenance and a high cost of ownership with the colorimetric analyzer. The overall result was an expensive chlorine treatment process that required too much staff time and too much retreatment with additional chlorine at a cost higher than necessary to ensure clean water service. When chlorine is added to water treatment processes, it forms hypochlorous acid (HOCl) and hypochlorite ions (OCl-). They are the primary disinfecting compounds in chlorinated water. The amount of these compounds present in the water available for disinfection depends on the pH level of the water. If the pH drops to 6.5, the acid form is 90% HOCl and 10% OCl-. At a pH level of 8.5, the alkaline form predominates as 90% OCl- and 10% HOCl. Hypochlorous acid has roughly 10 times the oxidizing power of hypochlorite. The sum of these two chlorine compounds is referred to as “free chlorine,” because it is “free and available” to disinfect the water. The DPD colorimetric method of water analysis has been the industry standard technique for chlorine measurement for many years. It is a simple test that can be taken in less than five minutes with test strips or crushed powder that requires visual analysis for measurement. Determining with the naked eye or a color scale how “pink” the test strip is to determine the amount of chlorine present in the process is one of the problems with the colorimetric method. This manual method also does not provide real-time chlorine measurement, and it requires manually taking the test at the process location. With an automated colorimetric analyzer, a sample is taken every few minutes and the results are reported on a display. Even though the analyzer system is automated, the data are not providing a real-time measurement (two- to three-minute cycles), which was causing problems for the water company to properly dose its process. Dealing with the monthly accruing cost to replenish the reagents required for the analyzer was another issue. Disposing of the reagent waste that the analyzer produced also became a headache. Proper waste management was required. By comparison, amperometric analyzers provide real-time chlorine measurement. There also are no messy reagents to deal with monthly. The sensor relies on two electrodes (anode and cathode) to provide chlorine analysis. They measure a change in electric current caused by the chemical reduction of hypochlorous acid at the cathode. The electric current flowing between the two electrodes is proportional to the chlorine concentration. The electrode’s membrane and an electrolyte solution help to control the chemical reaction. Care also must be taken to control the flow rate and pressure to obtain an accurate measurement. To solve the problems with its chlorine disinfection process, the water company’s process team contacted the engineering firm Bosmann Solutions PLT to review the chlorine measurement issue. The team at the engineering firm reviewed the chlorine measurement problems and recommended replacing the colorimetric analyzer with the FC80 amperometric analyzer from Electro-Chemical Devices to provide much-needed real-time chlorine measurement and to reduce the maintenance issues. The water company’s process engineers appreciated the fact that the FC80 analyzer is a panel-mounted, ready-to-use full system. It is designed to monitor free chlorine in drinking water, rinse water, cooling water and other water samples from 0.05 to 20 ppm chlorine as the standard range or 0.01 to 5 ppm with the low-range sensor. It is compliant with U.S. Environmental Protection Agency (EPA) Method 334.0 for measuring drinking water. The FC80 analyzer features a plug-and-play design that incorporates a constant head flow control device, a pH sensor, a chlorine sensor and the T80 analyzer/transmitter conveniently mounted on a PVC panel. The water company found the instrument setup relatively easy; it required only one technician with no special tools to connect the sample and drain lines, then connect the power and outputs, and it was ready to use. Calibration is accomplished by DPD comparison due to environmental regulations. Amperometric chlorine sensors are flow-, pH- and temperature-sensitive. The minimum required flow by the sensor is 0.5 per second; above this value, the output is virtually flow-independent. A “constant head” flow control device (CFD) maintains the optimum flow past the sensor over a wide range of incoming sample flow rates. The minimum flow required for the CFD is 10 gal per hour, and the maximum flow is 80 gal per hour, with the sample going to drain at atmospheric pressure. pH and temperature are compensated for with the digital S80 sensor for a reliable measurement. With the manufacturer providing a complete panel-mounted analyzer system, the water company plant team recognized its value in that there was nothing else to purchase or install in a sample conditioning system. After several months of use, the water company reported that the accuracy of its chlorine measurements had improved greatly and had eliminated the need for extra disinfection retreatment cycles. Consumption and costs for chlorine were lower, which also is environmentally friendly. The plant staff also found that the elimination of the reagents required by the colorimetric analyzer had reduced sample pump and tubing maintenance and replacements, again requiring less staff maintenance time and entirely eliminating the monthly expense of reagents.